Specialty Food Business Seminar Series. Christian County and Montgomery County Extension offices. The seminars will be held the second Monday of each month starting in January and ending in May. The seminars are free and the public is invited to attend any or all of the seminars they choose. Importance of Branding - Monday, March 13, 2017 (1-3 pm). Featuring local vendors with regional branding experience. Agri-Tourism - Monday, April 10, 2017 (1-3 pm). A panel discussion, representatives from Illinois South Tourism will be part of the discussion. Social Media - Monday, May 8, 2017 (1-3 pm). May's topic will be presented by Terri Miller, Promotion and Publicity Specialist, UI Extension. She will address best practices for social media and current trends. Annie's Project is an educational program dedicated to strengthening farm women's roles in the modern farm enterprise. What to Think About Before You Plant, 2-Part Webinar Series. The University of Kentucky's Center for Crop Diversification is hosting a two-part webinar series in March based on our publication, What to Think About Before You Plant. The first webinar, on March 7 from 3:30-4:30 p.m. Eastern time, will focus on direct-to-consumer markets such as farmers markets and Community Supported Agriculture. The second webinar, on March 14 from 3:30-4:30 p.m. Eastern time, will focus on larger scale markets, and special considerations to successfully grow your business. The webinars are free. To register, visit http://www.uky.edu/ccd/beforeyouplantwebinar . High Tunnel Workshop, Monday, March 27, 4:00 to 6:00 p.m., Jackson County Extension Office High Tunnel, 402 Ava Rd. Murphysboro, IL 62966. Learn about winter & summer high tunnel production, management, and current research. Program fee is $5.00 per person. To register call the Jackson County Extension Office at 618-687-1727 or contact Nathan Johanning at that number or njohann@illinois.edu. Bi-State Compost School, June 21-22, 2017, Henry White Experimental Farm & St. Louis Composting, Belleville, IL. The school is an intensive 2 day program for new and experienced mid to large scale composting operators that will train participants in the science and art of composting. For more information or to register visit http://go.illinois.edu/bistatecompost or contact Duane Friend at friend@illinois.edu or 217-243-7424. Registration is limited to 30 participants. SPRINGFIELD, Ill. - The Illinois Department of Agriculture (IDOA) is now accepting proposals for federal specialty crop grants. The agency anticipates Illinois will receive roughly $525,000 from the United States Department of Agriculture (USDA) to distribute to state projects; however, the exact dollar amount has yet to be determined. The funds will come from the Specialty Crop Block Grant Program in the Farm Bill. They are available for projects beginning in calendar year 2018, and are intended to expand the availability of fresh, locally-grown produce and strengthen the competitiveness of our specialty crop industry. According to USDA, projects seeking funding should benefit underserved communities and veterans, aim to improve producer capacity with the requirements of the Food Safety Modernization Act, develop adaptation and mitigation strategies for farmers in drought-stricken regions, increase opportunities for new and beginning farmers, develop strong local and regional food systems, protect pollinator habitats and improve pollinator health. Projects that benefit a particular commercial product or provide a profit to a single organization, institution or individual are ineligible. Farmers' markets, roadside stands and community-sponsored agriculture programs should consider submitting proposals to the USDA's Farmers' Market and Local Food Promotion Program. "Over the years this grant program has become highly competitive with the number of applications growing each year," said Director Raymond Poe. "That is a testament to Illinois' agriculture community. These projects have identified needs in our communities, and are encouraging more and more people to participate in agriculture and healthy lifestyles." The USDA's Agricultural Marketing Service defines specialty crops as "fruits, vegetables, tree nuts, dried fruits and horticulture and nursery crops (including floriculture)." Illinois is the nation's leading producer of pumpkins and horseradish, and ranks in the top ten in acreage of cantaloupes, green peas, lima beans, and sweet corn. Illinois also is home to a flourishing grape and wine market. Sales of all specialty crops in Illinois, including nursery and greenhouse sales, totaled almost $470 million in 2012. The IDOA will accept grant proposals until April 28, 2017, at 4pm. Request for proposal packets and additional information about the program can be found online at the department's website at https://www.agr.state.il.us/speciality-crop-grants/. For more information call (217) 524-9129. For many years we have recommended that sweet corn growers use a wire "Hartstack" trap baited with a pheromone lure to monitor corn earworm flights and make decisions on spray timing. Bob Poppe of Lexington, Illinois, the long-time go-to manufacturer of these traps passed away last September. His son, Kevin, will continue to manufacture and ship these Hartstack traps. His contact information is Kevin Poppe, 309-365-3651, email kdpoppe99@hotmail.com. The Illinois CAPS program is currently seeking cooperators to be part of its statewide orchard and vineyard surveys. This summer we will once again be conducting surveys focused on several invasive pests we feel are a threat to the Illinois Specialty Crops Industry. We want to identify 20 vineyards and 20 orchards/fruit growers in Illinois to participate in the surveys. Your involvement requires only permission for us to place traps in areas around your property. These traps will be clearly marked. All activities related to trap placement, monitoring, and removal are the sole responsibility of the trapping program. Biweekly visits to the property to check traps and lures will occur throughout the summer. Traps would remain in place until September. We are also in search of walnut plantings to place traps for our Thousand Cankers Disease survey. If you are interested in purchasing a copy of the 2017 Midwest Fruit Pest Management Guide, please contact the Jefferson County Extension Office at (618) 242-0780 or the Madison County Extension Office at (618) 344-4230. If you are interested in purchasing a copy of the 2017 Midwest Vegetable Production Guide for Commercial Growers, please contact the Madison County Extension Office at (618) 344-4230. From north-central Illinois... Last week went from over 70 degrees Fahrenheit on Monday to 20 degrees Fahrenheit on Friday evening. Now that the weather has turned closer to average, the high tunnel sides went back down and will likely stay down for the foreseeable week. Despite the cold snap, temperatures are still above normal. I photo document the red maple tree in my backyard each year. On March 2, I noticed the red maple's flowers were fully open. Looking back at my previous photographs, we are about a month ahead of when this tree typically flowers. In 2015, I photographed the red maple's flowers which had just started to open on March 22. The high tunnel will be living up to why we build these structures. We are expected to have bright sunny days with highs in the 50s and chilly nights with lows just above freezing. Capturing that solar energy during the day is my goal to keep the interior warmer at night. My tunnel leaks enough that it often doesn't need to vent until we get temperatures in the uppers 60s or 70s. Growers seem to be scrambling to keep up with the weather. One grower is still hoping to get their apples pruned and sprayed. Many farmers are talking about the blooming peach trees in southern Illinois. Whether or not southern Illinois peach trees are actually blooming matters less than the very real early start to the growing season. The peach tree outside my office window in Macomb has shed its outer bud scales but has not yet started to show any pink color. Growers and homeowners may have missed the dormant oil spray. A dormant spray before bud break prevents the disease peach leaf curl. If that is the case, we may see an increase in peach leaf curl questions. My garlic, was about three-inches tall nearly a month ago. Now the tips of the garlic leaves are brown and wilted, likely a victim of cold damage. Keep strawberries mulched, so they don't start too early. Asparagus can weather a hard frost. Any spears that have emerged will only die back to the ground as if it had been harvested. Freezing temperatures shouldn't affect the overall health of the plant. Most growers have summer vegetable transplants going, but not yet in the ground. Western Illinois University horticulture students came out and planted the Extension high tunnel last week with cool season crops. After having the high tunnel out of production for the fall and winter, I am looking forward to growing in there once again this spring. From the St Louis Metro East... The entire region is preparing for below freezing temperatures predicted four nights in a row beginning Friday, March 10. Crops most vulnerable to crop loss due to freeze injury at this time are early blooming strawberries and tree fruit. A few apple cultivars like Jonagold, Granny Smith, Firmgold and Braeburn are reported at ¼" green. Early blooming peaches like Bounty and Coral Star are beginning to show color. Pluots and Apricots are in full glorious bloom. Sweet Charlie strawberries are in full bloom. The first step in preparations for a possible strawberry protection event is to know what stage of development the plants are and what the forecasted low is to determine what strategy to use. Research shows that strawberries are at their most vulnerable during full bloom to temperatures below 30°F, followed by "popcorn" stage at 26.5°F then tight bud at 22°F. Layered covers have been reported to provide better insulation than a single layer of the same total weight. In other words, applying two layers of a 1-ounce cover is better than one layer of a 2-ounce cover. For growers using frost irrigation, keep in mind that below freezing temperatures under windy conditions (advective) makes it increasingly difficult to provide the crop with the necessary conditions of uniform irrigation patterns and continual heat release. Under optimal conditions, water freezing is a heat releasing process. The opposite is true when liquid water becomes a gas (evaporative cooling) and this can happen even under freezing temperatures if there are windy conditions. The table below shows some suggested precipitation rates under varying environmental conditions to ensure uniform ice formation. In general, as temperature decreases and/or wind speed increases, flow rate must increase to compensate for evaporation. Source: Perry, K. 1998. The strawberry grower. Vol. 5 No. 2. From southern Illinois ... We have still been generally warmer than average for the season thus far. Highs have been in the 50s and 60s most days. We have had some rainy/cloudy days, but many bright sunny days in between. In the last 10 days we have had 2 main fronts that have come through and generally across the area we have received 1-2" of rain across this time. Last week we also had some severe weather with that system including multiple tornadoes including one that passed through about 5 miles north of my office in Murphysboro. The rain has brought our soil moisture at least at the surface up to more normal levels for early March. Generally, our temperatures are supposed to stay fairly moderate; however over the upcoming weekend we have a chance for some wintery precipitation and lows predicted to be somewhere in the 20s, but it is too early to know just how cold it will get. Our fruit crops generally are about 2 weeks ahead of normal. Some of the earliest peaches are starting to bloom on down to some of the later varieties that are still swollen with just a small amount of pink if any visible. Most varieties are heavily loaded with flower buds. Given the cold snap for the weekend hopefully we will escape any major issues with that good set of fruit buds, and hopefully bloom doesn't progress too much further before then. Make sure we keep up with dormant or delayed dormant sprays on all of our perennial crops to help reduce any disease potential for the upcoming season. See the notes later in this issue or the 2017 Midwest Fruit Pest Management Guide for more details. I have not seen any signs of asparagus emergence as of yet, but as planned I did get a burndown herbicide application applied and it is starting to work. Growers are getting summer annual plants ready to set in the high tunnels. Our carrots in our high tunnel are really putting on some size and harvest will be coming fairly soon. With the warm and wind be scouting for aphids in our high tunnels. This is a time of year we start seeing them more and with tunnels open to vent they can easily slip in and get established before you know it. We did have a few aphids come on the carrot tops, but given harvest soon and that the tops are not what we are looking to consume we will probably just live with them for now and make sure to get them out with carrot harvest. Average winter temperatures in Illinois for 2016-2017 were very similar to 2015-2016. Warm temperatures during the months of December, January and February favor increased survivorship of the corn flea beetle and the bacterium it vectors. In a recent press release from the Prairie Research Institute, Jennie Atkins (Illinois State Water Survey's WARM Program manager), reports soils have been steadily warming since early February. Long term, the soil temperatures have been 2.5 degrees above average, but 0.4 degrees lower than last year. The highest soil temperatures were reported in southern Illinois (39.4 degree seasonal average, 2.6 degrees above normal). Figures 1, 2 and 3. Average winter temperatures of 2014-2015, 2015-2016 and 2016-2017. Corn flea beetles are the primary vector of Stewart's Wilt. Erwinia stewartii, the bacterium that caused Stewart's wilt, survives the winter in the gut of the corn flea beetle and the survival of the corn flea beetle is dependent on winter temperatures. Warmer winters result in greater survivorship of corn flea beetles, thus increasing the potential for Stewart's wilt. Using the average temperatures of December, January, and February, the potential for Stewart's wilt can be predicted (Table 1). Table 1. Projected risk of Stewart's wilt based on the average temperatures of December, January, and February. Corn flea beetles become active in the spring when temperatures rise above 65°F, and they feed on and transmit Stewart's wilt bacteria to seedling corn plants. The bacterium can spread systemically throughout the plant. Although most commercial field corn hybrids are resistant to Stewart's wilt, the disease is still a concern for susceptible seed corn inbreds and many sweet corn hybrids. There are two phases of Stewart's wilt: the seedling wilt phase and the leaf blight phase. The seedling wilt stage occurs when seedlings become infected at or before the V5 stage. The vascular system becomes plugged with bacteria, causing the seedling to wilt, become stunted, and die. Infections of older corn plants usually result in the development of the leaf blight phase of Stewart's wilt. This phase is characterized by long, yellow to chlorotic streaks with wavy margins along the leaves. When the late infection phase or "leaf blight phase" of Stewart's wilt occurs after tasseling, it is generally not a concern in sweet corn because ears are harvested before damage occurs. Based on the recent winter temperatures from the Midwest Regional Climate Center, estimates of early season Stewart's wilt are shown in Table 2. Remember, however, that these are only predictions; numbers of surviving corn flea beetles are not known. Table 2. Early season Stewart's wilt predictions, 2017. An updated version of my usual pre-season corn earworm management recommendations ... but does include updates on Bt resistance in corn earworm populations and a condensed version of recommended management practices. Corn earworms are often the most damaging insects in sweet corn in the Midwest. They overwinter in the pupal stage in the soil, but their survival rate is very low in most of the region. This winter has so far been very mild, but even so, the local overwintering survival of corn earworm pupae is not likely to be the cause of heavy moth flights in most parts of the state or region. Corn earworm manages to be a severe pest every year anyway because it migrates in from southern states on weather fronts every summer. In much of the region the period of first activity (and the first need to control them) can vary from June through August, depending on the time of their migration and the availability of sweet corn that is silking. Although control may be necessary in one portion of the region at a particular time, it may be unnecessary in many other locations. Consequently, it really is essential to establish a monitoring program to determine spray needs. Unfortunately, scouting for foliar damage or larvae on the surface of plants is not an option. Corn earworm moths lay their eggs singly on silks, and larvae move down the silk channel immediately after they hatch from the eggs (and hatching can occur in as little as 2 ½ days during hot weather). On corn, larvae do not feed on any exposed parts of the plant (leaves, husks, etc. ), so the only practical way to kill them (short of having planted BT sweet corn, which does not provide 100 percent control) is with a contact insecticide applied to the silks. Larvae crawl across the residues on the silks, and the insecticide is taken up through the cuticle. Left: Corn earworm larva. Right: Hartstack trap. Corn earworm moth (Kansas Department of Agriculture). 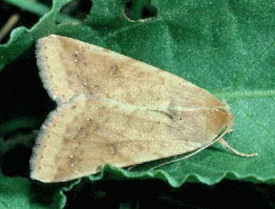 Effective monitoring programs depend on the use of pheromone-baited traps that catch male corn earworm moths and are used as indicators that adults of both genders are present and eggs are being laid. Until about 10 years ago we recommended using either a wire Hartstack trap (pictured above) or a nylon version of the same general design marketed by Scentry and several regional distributors. We've long known that paper sticky traps are ineffective at monitoring corn earworm moths, and about a decade ago research indicated that the Scentry nylon cone traps do not really work well enough. Results from monitoring work done in 2006 showed that the nylon traps also may fail to detect light but still significant flights when the wire Hartstack traps do catch moths. Consequently, I now recommend that all sweet corn and seed corn producers use the wire Hartstack trap. (Data to support this recommendation came from a regional monitoring effort coordinated by Bill Hutchison of the University of Minnesota and conducted by several entomologists and horticulturists who participate in the Great Lakes Vegetable Workers Group.) Traps should be baited with Hercon "zealures," and the lures need to be replaced every 2 weeks. Earworm control is necessary when moth flight is ongoing and fresh silks are present. If traps are catching more than ~10 moths per trap per night when silking begins, sprays should be applied within 2 days after first silk - insecticide residues must be on the silks to kill larvae immediately after they hatch from eggs and before they enter the silk channel. If the only silking corn in your area is your field, the threshold for treating should be revised down to 1 moth per trap per night ... in your traps or those operated by your neighbors. These traps will last for many years (I have a couple that are over 30 years old) ... as long as you don't run over them with tractors or other vehicles. Along with a few dollars for lures every year and daily monitoring of moth counts, they provide you with guidance that can keep you from spending thousands of dollars unnecessarily or losing thousands of dollars' worth of sweet corn sales. If you spray 10 acres of sweet corn even twice a week for 3 weeks before earworms are actually present and require control, that's 6 applications at (conservatively) $20.00 per acre for each application if you use something that's effective ... multiplied by 10 acres, that's $1,200 (plus the loss of time not spent doing something more necessary). Multiply that by a 20-year life span for the trap, and the total exceeds $24,000. I think that pays for the trap and the lures. Viewed in a different way, if high trap counts lead you to spray more often in order to get the control you really need, you market more corn. For a fresh-market producer who sells sweet corn at the low price of $4.00 per dozen, a yield of 1,200 dozen per acre is worth $4,800. Preventing a 5 percent loss by spraying extra when needed saves $240 per acre in sales. Multiply that by 10 acres and 20 years, and the total reaches $48,000 ... that, plus keeping your customers from complaining about wormy corn, certainly pays for the cost of a trap and a package of lures every year. The goal of insecticide applications in sweet corn is to put a residue on fresh silks that kills larvae before they can move from the egg on the silk into the tip of the ear. (If sprays kill some adults, that's a benefit, but that's NOT what makes an effective spray program, especially for growers with smaller fields and diverse plantings.) This means that sprays must be applied repeatedly as the silks elongate. Although the residual activity of many insecticides is several days, newly emerged portions of silks near the ear tip were not exposed to the sprays applied a couple of days earlier. This is why sprays are recommended on 2- to 3-day intervals as long as silk growth continues. If traps are catching just a few moths and temperatures are moderate, a 3-day spray interval can be adequate. If traps are catching 30 or more moths per night and temperatures are in the 90s, spraying every 2 days will be necessary to produce corn with very few damaged ears. Sprays should begin within 2 days after silks have begun to emerge if moths were flying when silks appeared. At least some of the corn earworm populations that migrate into the region each year are resistant to pyrethroids (Baythroid, Brigade, Hero, Mustang Max, Warrior, and their generic versions). Alternatives to pyrethroids – such as Coragen, Entrust (for organic growers), and Radiant – are not quite as effective as the pyrethroids used to be before resistance development. Where markets demand corn that is worm-free or very nearly so, relying on a pyrethroid or an alternative alone is not likely to give adequate control when moth flights are high. Combinations of a pyrethroid plus one of these alternatives or a pyrethroid plus Lannate are likely to give the best results. If you take this approach and tank-mix two different kinds of insecticides, use each at their label rates (often the middle of range listed on each product's label). Making timely applications on the right interval (2 or 3 days) is FAR more valuable than using the highest possible rates. A pre-mix of the active ingredients in Warrior (lambda-cyhalothrin) and Coragen (chlorantraniliprole) is sold under the trade name Besiege. It provides an alternative to tank-mixing two different chemicals. What about Bt sweet corn varieties? From a grower's perspective, there are three different categories of Bt sweet corn varieties on the market. (1) The Attribute series sweet corns produce one kind of Bt toxin. It is very effective against European corn borer and has been moderately effective against corn earworms. The "problem" is that only 3 of 4 kernels on ears in Attribute series Bt sweet corn fields produce the toxin (a result of the heterozygous nature of the genetics of the variety and random recombination in the offspring – the kernel, because the endosperm is F1 tissue). Additionally, the Bt toxin in the Attribute series is not very effective against black cutworm or western bean cutworm (and not at all effective against rootworms or sap beetles). (2) The Seminis "Performance" series of Bt sweet corn varieties produce two toxins that kill Lepidopteran larvae; they also have genes for corn rootworm larval resistance and resistance to Roundup. The second Bt toxin in these varieties provides much better control of black cutworm, fall armyworm, and western bean cutworm (as well as European corn borer and corn earworm). However, only 3 of 4 kernels on ears in Performance series Bt sweet corn fields produce the toxin (again, a result of the heterozygous nature of the genetics of the variety and the fact that the genes for the two toxins are linked and so they move together – not independently – in the recombination of genes in the offspring – the kernel). (3) The "Attribute II" series of sweet corn varieties developed by Syngenta includes a few new varieties for 2017. In the Attribute II series, genes code the production of two very different toxins (including one referred to as the Viptera trait) that kill Lepidopteran larvae (cutworms, armyworms, European corn borer, and corn earworm). These genes are not linked, and as a result, 15 of 16 kernels on ears in Attribute II series Bt sweet corn fields produce one or both toxins. The Attribute II hybrids that I and others have tested have been far more effective against corn rootworms than any other Bt hybrids available to date. Information on Syngenta's Attribute and Attribute II series Bt varieties is available at http://www.syngenta-us.com/seeds/vegetables/sweet_corn/sweet_corn.aspx?tab=3; information on the Seminis Performance series Bt sweet corn varieties is available at https://www.seminis.com/global/us/products/Pages/Performance-Series-Sweet-Corn-Seed-Varieties.aspx. How about resistance to Bt toxins? In the last few years, growers and researchers have observed increased infestations of corn earworms in several Bt sweet corn varieties, raising concern about the development of resistance to one or more Bt toxins in populations of this insect. In 2015, Reisig and Reay-Jones reported evidence of resistance to the Bt toxin Cry 1Ab (the sole Bt component in the original Attribute varieties) in North Carolina and South Carolina. In December of 2016, Dively et al. reported evidence of resistance to Cry1Ab (event Bt11) and Cry1A.105+Cry2Ab2 (event MON89034) in a population from Maryland. Given observations of control failures in Illinois and elsewhere in the Midwest, resistant populations most likely are present here as well. I am NOT aware of any reports of resistance to the Viptera trait (Vip3Aa20) that is part of the Bt package in Syngenta's Attribute II series varieties. Do Bt sweet corn varieties still need to be treated with insecticides? Yes ... although the Attribute II series will suffer less damage when untreated than other existing Bt varieties. The original Attribute series and the Performance series varieties must be treated when corn earworm moth flights are moderate to heavy. Given the resistance issues outlined above, I recommend that they be treated roughly the same as non-Bt varieties ... they will provide some earworm control on their own but not enough to result in the near-total prevention of infestations in ear tips that most commercial growers must achieve. Buy a trap and lures. Check the trap daily when corn begins to silk. Replace lures every 14 days. Moderate pressure: If field corn in the area IS SILKING and traps are catching more than 5-30 earworm moths per night, apply a spray every 3 days, beginning 2 days after first silk and ending 4-5 days before harvest. Moderate pressure: If field corn in the area IS AT BROWN SILK OR LATER and traps are catching 1-30 earworm moths per night, apply a spray every 3 days, beginning 2 days after first silk and ending 4-5 days before harvest. High Pressure: If traps are catching more than 30 moths per night, spray every 2-3 days and always use a combination of a pyrethroid and an alternative chemistry. Mustang Maxx at 3.5 fl oz/A. Limit = 24 fl oz/A/season, PHI = 3, REI = 12 h.
Lannate LV at 1.5 pints/A, PHI = 0, REI = 48 h.
Coragen 1.67 SC at 4 fl oz/A, PHI = 1 day, REI = 4 h.
Radiant SC at 5 fl oz/A. Limit = 6 applications /season, PHI = 1, REI = 4 h.
Besiege at 8 fl oz/A. Limit = 31 fl oz/A/season, PHI = 1, REI = 24 h.
Bt (GMO) sweet corn ... You might choose to plant Bt sweet corn, especially for your late plantings. Because of recent reports of corn earworm resistance to one or more Bt toxins produced in Bt corn, I recommend you should expect the Attribute II Bt sweet corn varieties from Syngenta to provide the best earworm control (if they meet your market demands). These contain what's sometimes called the Viptera trait. Your seed reps can discuss possibilities with you. If you plant any Attribute II varieties for late harvests (in order diminish likely infestations), I suggest you treat them about the same as you would treat a non-Bt variety ... but you should expect to get a full harvest without significant infestations. Superior oil, also called dormant oil, emulsifiable oil, or other terms, may be an "old" product but it still plays a very important role in insect management. Application of dormant oils prior to bloom – from green tip to pink – is very effective for killing overwintering eggs of European red mite and rosy apple aphid and overwintering immature San Jose scale on limbs and twigs of perennial fruit crops. These oils are emulsifiable – they disperse well in water. When sprays are applied to trees and the water evaporates, a very thin film of oil remains on the limbs and twigs ... and on the eggs and scales of rosy apple aphid, European red mite, and San Jose scale. That film of oil blocks respiratory openings and results in suffocation of the creatures inside the eggs and scales. Application of superior oils prior to bloom is relatively inexpensive, very effective, and has little negative impact on natural enemies that help keep various pests in check later in the season. Many of the superior oils labeled for use on fruit trees are OMRI-approved ... they can be used in certified organic production as well as in conventional production systems. Emulsifiable oils are applied on a "percent-by-volume" basis ... at green tip to half-inch green they should be used at 2% by volume – 2 gallons per 100 gallons of water in the spray tank. Thorough coverage is essential for these applications to be effective ... they suffocate only the eggs or scales that are covered by a thin film of oil after the water evaporates. If oils are used as late as the pink stage, most recommendations call for a lower percentage of oil in the spray mix – ½ to 1 percent by volume – to avoid plant injury. Other insecticides can be added to the spray tank to increase control of rosy apple aphid or San Jose scale (see page 15 in 2017 Midwest Fruit Pest Management Guide), but oil alone is very effective. Most references recommend that superior oils not be applied if temperatures are forecast to drop below freezing in the next 48 hours. Although "summer oils" can be used post-bloom to suppress populations of several pests, applications made after foliage has emerged can damage leaves if Captan or certain other fungicides are used before or with emulsifiable oils. With our almost non-existent winter and early spring-like days, dormant and delayed dormant sprays may be needed early, hopefully not already past, for most growers. Dormant copper sprays are very important in the control of Peach Leaf Curl and may be applied after leaf drop in the fall but before bud swell in the spring (hopefully more southern growers have not missed the window of opportunity yet). Dormant copper sprays are also listed in the Midwest Fruit Pest Management Guide 2017 as offering some level of control or protection against fireblight in pear, black knot in plum, and bacterial canker in cherry. Lime sulfur solution sprays at the delayed dormant stage are also an important step in helping to control several diseases of small fruit crops. The Midwest Fruit Pest Management Guide 2017 recommends lime sulfur sprays in blueberries after bud break for phomopsis cane and twig blight, in grapes thru bud swell for anthracnose, and in raspberries/blackberries when bud tips show green for anthracnose, cane blight, and spur blight (reds only). Please remember to read your spray guide and product labels thoroughly for specific comments, recommendations, and warnings regarding rate, timing, tank mixing, etc. for all spray applications, not just dormant or delayed dormant sprays. Different crops have different growth habits and tolerances and special care needs to be taken to avoid crop injury.